A double IPA that is hazy pale in color with a strong pungent aroma that comes from large amounts of Citra hops. 22oz bottle generously shared by Doug. Thanks man! Poured into a Bell's snifter today, 3/11/2014. Must be about 2, 2.5 weeks old as this is from the previous release. App- Clear caramel-amber body, with a nice 2-finger white head with good retention, not much lacing. Fairly typical of a DIPA. Smell- Pineapple, a bit of grapefruit and lemon. Good malt backbone consisting of caramel and brown sugar. Flavour- Grapefruit with a hint of pineapple, caramel and toffee. Solid, even very good. The citra hops aren't bursting through the seams here. Not complex, not juicy, but certainly bitter. Mouthfeel- Medium bodied, good carbonation, probably the best feature behind this beer. Fairly bitter, but not particularly resinous and it doesn't stick for a long time. Nice, palate drying finish. Overall- This is a good Citra hopped DIPA. Technically, it's not single-hop Citra per the label. But King Sue, which is a single hop citra DIPA, wipes the floor, ceiling and all 4 walls with this beer. To me, this beer's popularity is borne at least partially from west-coast hype and scarcity. Don't get me wrong, this is a good beer and I enjoyed it, but given what west coast traders are asking for this, I'd very much rather pay the asking price for Abner or Double Sunshine. As a side note for my west coast friends, you should spend the time you'd chase KRBC Citra on finding Citra Showers the next time Noble brews it. That is a very similar quality citra beer that reaches distribution. Golden, slightly hazy with no visible cardio and a finger of white head. Smells of pineapple, citrus and a hint of pine. A Caramel malty backbone follows. Tastes of perfection in balance. Fruity and floral almost like a rose, lily of the valley. Caramel sweetness with a hint of bitterness like grapefruit pith. Medium body with a little spritzy carbonation. Covers the abv. Having on tap at Liquid Gold, San Francisco, Dec 30th, 2018. Amazing brew. The feel is powdery and amazing, the taste so soft yet defined so that it finishes quickly on the palate, leaving you craving the next sip. Surprised by the haze, it's a nearly fully opaque orange-amber with a lighter gold around the bottom edge, topped with a large khaki foam that slowly settles to a thin film with a bubbly clinging collar. Smell actually starts garlicky and biscuity, with some sharp yeast, orange zest and rind, lemon and pine. Taste is tangy and almost spicy with a mix of allium and citrus, backed by a sting of pine and a biscuity rug with a Triple Sec finish. This is definitely more old school, malty, bitter and pungent than the new haze class, but is also very citrusy and enjoyable. Body is moderately light with a bubbly light carbonation and a dry, prickly swallow. Big thanks to dgb3 for generously sending this growler my way. I've had the Citra Hop exactly one time from a homebrewed IPA and it was bomb.com. Drank from my Surly AHA Rally pint glass. Appearance- Pours a burnt sort of orange with a light bit of chill haze and a perfect one finger creamy off-white head. A decent cap and collar remains along with plenty of thick rich lacing. Smell- Not as pungent as you'd expect from a big DIPA but it is somewhat fruity. Some papaya, peach and apricot all join the fruit party but I'd just like it to be more intense. The malt is very noticeable as well as there is a bit of a biscuit/caramel malt tinge. Definitely not the typical west coast IPA type smell. Not bad by any means, just not as interesting as I was expecting. Taste- Hmmm... interesting. Very malty and lightly sweet with a bit of a orange marmalade like thing going on. Maybe some grapefruit and papaya but nothing in the realm of really fruity or citrusy. I get a touch of pine every now and again as well. The malt could be the dominate characteristic in this beer though as some toffee/caramel is evident right from the get go. A grainy sort of toast is present as well. The 8% is hidden extremely well though. I wouldn't guess this beer was over 4-5%. Mouthfeel- Nice full body with a soft biting carbonation. Probably the best part of the beer. Drinkability- If I was to take a drink of this beer (not knowing what it was) and was told to guess what it was, NO WAY I'd say a Double IPA. Maybe I'm just too used to the big brash hoppy IPA's but for some reason this beer just didn't do it for me. I had big hopes too considering how good Kern River's Just Outstanding IPA was and how good the homebrewed Citra IPA was that I had. Oh well, can't love every beer but it was still great to try. Thanks much Dan! 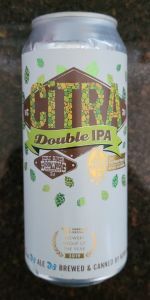 I have been trying to get my hands on Citra for some time and I finally copped a bottle down the from my house. Pours a very nice very clear amber hue with a fluffy off white head that had some great hang time. Definitely left some nice lacing on the glass the entire drink. Aromas are just jumping out of the glass like crazy. There are piney notes, big tropical fruit like mango and pineapple and some citrus aromas as well. I have to say its perfect. Taste again I have to say perfect. I have not had a more easyh to drink DIPA that packs this much flavor. Hops are in your face but not off-putting at all. Sweet upfront with bitterness all the way to the dry crisp end. There is nothing I don't like here. Drinkability is perfect. Crisp and refreshing with full flavor, it's a win all the way. I need to get more of this while I can. Huge thanks to alcstradamus for the chance to sample this one. Poured into my pint glass the beer is cloudy cider orange gold. Three fingers of eggshell hued head recede slowly leaving thick gobs of lace. The aroma is full on juicy citrus. Loads of mango, grapefruit and pineapple. The flavor is a super resinous hop blast. Citrus is all over my tongue. Dry bitter finish. Light hints of malt. Overall a decent DIPA. Nothing epic. 22oz bottle (no dates, but this is fresh, 2011) poured into a tulip. Thanks again sleepyhead for this totally unexpected gift from the gods! Pours a slightly hazy copper color with a fluffy 2-finger head that leaves nice lacing. Aroma is a tropical burst. Mango, pineapple, grapefruit and orange. There's also a nice malty aroma and slight booze in the background, all combining wonderfully. Taste is seriously delicious and hoppy, but there's a good malt base there too. Tastes like an imperial Two Hearted. Alcohol is definitely present, but it works as an ingredient that adds to the flavor profile. This one definitely lives up to the hype, and it's in the same league with Pliny or anything I've had from Alpine. If only this beer were available year-round, locally. Feeling very fortunate right now that I got a chance to try this. This is truly a delicious beer. Everything about it is outstanding. I tried the lottery to try to buy this beer but no dice this year. I'll keep trying. It's really worth it!